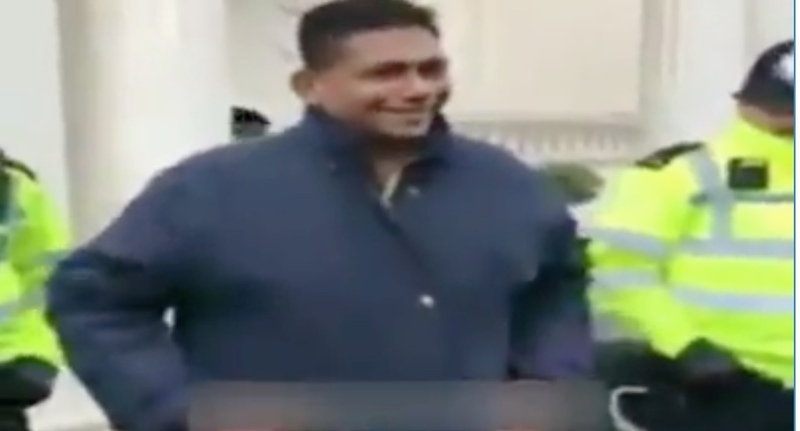 The television station Derana has used footage related to a demonstration against Sri Lanka over the treatment of Tamil Nadu fishermen by the Sri Lankan Navy to gloss over the recent incident at the same place where Brigadier Priyanka Fernando, attached to the mission made a throat-cutting gesture. The television station showed footage of Fernando engaging with protestors over the issue of Tamil Nadu fishermen, but Derana made out that it was in fact footage related to the controversial gesture. ‘It is “nice” if the Foreign Ministry bases its decisions on videos and comments on Facebook. Since you have not seen the first part of that exchange, we will show it to you,” the presenter said. Thereafter the station proceeded to show footage of an exchange between the same officer, but a different set of protestors. The station clearly failed to see or deliberately ignored the difference in Fernando’s attire and the obvious difference in weather conditions evidenced in the footage. The incident which sparked outrage and precipitated an investigation by the London Metropolitan Police following complaints had the Brigadier using a ‘slitting-the-throat’ gesture. He was responding to protestors demonstrating over alleged human rights violations by the Sri Lankan security forces. Outraged protestors complained to the Police over what they considered a threatening gesture. It also prompted the British High Commissioner in Colombo James Dauris to lodge a strong official protest with the Ministry of Foreign Affairs. The incident also saw Paul Scully, Chairman of the All Party Parliamentary Group for Tamils, writing to the Secretary of State for Foreign and Commonwealth Affairs urging him to take immediate action and withdraw Brigadier Fernando’s diplomatic papers and expel him from the United Kingdom. Fernando was suspended but according to unconfirmed reports President Maithripala Sirisena is said to have revoked this decision following representations made by the Army Commander, Lt Gen Mahesh Senanayake. The television presenter, offering lengthy commentary, insisted that Fernando was acting in a very cordial manner. He failed to inform audiences that the footage had nothing to do with the incident that caused the furor in London a few days ago. Instead he implied that the exchange had preceded the throat-slitting gesture. The mainstream media all over the world leads us down the garden path. We are brainwashed daily and lead to believe what the media wants us to believe. Only the intelligent viewer will be able to see through and make an informed judgement. We have several photographs of brig. Fernando taken on the day with people known to us, where he was always in uniform and never in the coat he is seen wearing in this video footage. This video was taken on an earlier occasion and it has been deliberately flashed on this news channel distorting the truth. If you ask the channel to produce the video footage shown, you could see the date on which it was taken. So much for the integrity of media in Srilanka in order to cover up a crime. Pardon me for posting this here ………..there is a big hue and cry made about this soldier and his nonsense ……..but could you please give prominence to what the Auditor General has said about the misuse of borrowed funds/loans…….and the support needed to overcome the obstacles ………….. and pass the National Audit Bill. The Auditor General’s statement is a more important national matter than this stupid soldier’s antics that has taken so much of your print space. You mean this UNP drama to forget the Bond scam. I heard, that Mendis Brewery bought with money brought from england. that money had been taken by RAVI the LIAR to Singapore (“I suppose) then to england. Brought back by two people, both Tamils, at least one south Indian Tamil. That company was registered in virgin Islands…. something like that. Confused Paras or Deliberately confusing the other Paras? Are you guys trying to exploit the low average IQ of 79 of the Paras, in the Land of Native Veddah Aethho, Illegally occupied by the Paras from India, Bharat, Damba-Diva? Diaspora demonstration on independence day is hatred based, the war is over long time ago, those who can’t bear up defeat are still coming in different guise. This cry against gesticulation is a guess work, the best thing to do is taking the said officer to the task of reasoning that body language. It’s shame for the British authorities to behave in such a silly manner, knowing that the LTTE had been identified as the cruelest terrorist group in the world. The cruelty is still coming in different guise & the British seems to be trapped in it. Grow up Real Revolutionist there is a limit for white washing. By any chance are you related to Pol Pot the butcher. Isn’t it premature to take it that serious? It is more likely that he is closely related to VP or Dr Gota, or both. I agree with you not only Real fake Revolutionist but lot of others in this forum need to grow up. Real Revolutionaist. It is all politics just to fool stupid Tamils. I heard, these Tamils are against arjun mahendran arresting. they are preparing for that. this is al Arjun Mahdneran’s people. there is information that Arjun Mahendran is hiding in London. Mr.JIMSOFTY,almost all your comments are nonsense,where did you got this information?,please write the actual facts with proof. Are you walking with one leg ? Hear say evidence is not acceptable dear JIM. What about the racist Tamils who adore the barbaric killers the LTTE? When we have you, thrishu, Dr Gota, Wimal, …………….. Eagle, Fernando, …… we don’t need anymore Barbarians. Brigadier Priyankara Fernando is a war hero. He was merely referring to the cyanide capsule around terrorist neck and he should be honoured for defending the country..
Clean up the foreign ministry since they are cowards running colonial agenda..
Do you know the difference between a war hero and a war criminal? SL army is the Mortein for elam terrorists.. The Kallathonies now claimed to being Sinhala/Buddhists, Tamil/Saivaites, Tamil Muslims/Sinhala Muslims, …. Tamil Christians/Sinhala Christians, …..
Irrespective of their language, religion, …. date of arrival we need to send them back. If you don’t know the difference wait till the next ethnic war, taste the power of a bullet from the army and then you will know. Speak to the veterans who ran away from Elephant Pass and Mullaitive they will tell you exactly how they felt. My advice to you don’t stand idly right in front of them and make sure you guard your b***s all the time while talking to them. Who you call WAR CRMINALS, we call them WAR HEROES. that is why we respect them. If the President has revoked the suspension of Brigadier Prinka Fernando it is no surprise that Sri Lankan rulers have to uphold and enforce the official state policy of impunity to protect and shield the war criminals, criminals, looters, bribe takers, political thieves and thugs while successfully dodging international punitive actions. May god punish those who commit crimes in the land of Lord Buddah, the greatest Saint who preached peace, & tolerance. The land of Lord Buddha? Really? Do you also believe the myth that Buddha flew here? The land of the Buddha is India, not Sri Lanka. There is no fricking god you ignorant rustic. Only Siva’s Lingam will punish them. For more effect pour sandalwood water on it. What is the use of giving BUDDHISM the FOREMOST place. ‘Derana’ is derailed. Brigadier Priyanka Fernando doesn’t come under any category you have mentioned in your comment. God finally punished bloodthirsty Prabhakaran and saved our Sinhalese Buddhist land which tolerated his atrocities, bloodshed and gruesome crimes against innocent civilians for 30 very long years. No other terrorist leader in the world has survived that long. LTTE diaspora especially London LTTE diaspora who lived for decades on drug trafficking, human smuggling, arms smuggling and collecting ransom from Tamil businessmen still couldn’t come out of the shock of losing their illegal easy moneymaking trade with the death of Prabhakaran. They are still using Prabhakaran’s name and his Tamil Eelam ideology to instill fear and hope on innocent Tamils to continue collecting money to nurture the terrorist outfit abroad for their own personal benefit. When British colonial parasites ruled Ceylon, Demalu licked their boots to get favors and discriminate against Sinhalayo. Now the white politicians are licking the boots of Tamils in UK to get their votes. British colonial rulers are notorious for committing most heinous crimes against subjects in their colonies. In 1818 when Sinhala freedom fighters rose against British, they massacred all able bodied men, burnt down paddy fields and paddy stored in houses so that people starve to death, dumped dead bodies in wells, cut down all fruit bearing trees, destroyed the irrigation system and hanged the Sinhala leaders of the uprising. Now the descendants of those parasites coming to tell us about war crimes and human rights. UNHRC should set up a commission to investigate war crimes and human rights violations committed by British colonial rulers to have a historical record. Tamil Proverb, “Never trust a SINGALA, if a SNAKE and a SINGALA come to Tamil Eelam, let the SNAKE in and kill the SINGALA”. Could you cite your reference for Indian and Sri Lankan Proverb. It is dissimilar to the one I heard when I was very young. “Kill the Veddah, Rob the Buddha, Blame the Sudda”. Only people who bootlicked the British colonials were the Chingkallams , especially their elite and politicians. this is why the British handed the nation to them on a platter in 1948 with no safeguards for the island’s Tamil speaking population who until 1833 were a separate nation. It was the Sinhalayas, the Senanayakes, Bandaranayakes, Jayawardanas, Wijewardhanas, Kothalawalas, and many others who changed their religion and did all the ‘pakkali’ service to the colonial suddhas. That is why they gave the whole country (including the Tamil Homeland) to the Sinhalayas in 1948. The Sinhalayas even gave their women to those parangi suddhas in exchange for a bottle of wine and the children born to those parangi suddas were surnamed after them as De Silvas, Fernandos, Fonsekas, Dias, Coorays, De Souzas, Pereras, Peiris, Mendis and so on. The colonial suddhas established good schools to these Sinhalayas in Colombo, Kandy, Galle, etc for their ‘pakkali’ service and due to this all the konde bandapu moda Sinhalayas such as Somapalas, Appuhamys, Tikri Bandas, Kiri Hondas, and many others who were wearing amude, chewing bulath (betal) and spitting all over the countryside, travelling in Gon Karatte (Bullock Carts), whacking Kassippu, gobbling Veda-Mahathaya’s guli, and learning a few akuru at the Pirivena (temple schools) suddenly became civilized and educated and modified their names and lifestyles. I love what he did. Unfortunately, Tamils became active Once the Indoendance celebrations are over. That is typical Tamils. So, he may be saying until the next throat cut, so long. Why only British Tamil coolies are taliking about this and not the Indian govt or the Tamilnadu dalits. Brigadier Priyankara Fernando’s gesture need to be used at home. Why not get the Police to use this gesture at those protesting anti SAITM university students, striking Doctors, train drivers, and all other strikers who make our lives a misery over here in our resplendent island? This can be most effective, much more than tear gas and water cannon. Let us see whether the Joint Opposition and JVPers will rush to protect the throat cutting gesture makers! Stupid Derana. Stop trying to steal the limelight through stupidity.. I remember MR was also humiliated by his stupid Kewattayas sometime ago with doctored photos of him and wife with Obama couple in NY. I saw this video too. For a moment I thought there were Tamil Nadu LTTE supporters at the protest too, when I heard someone questioning the Brigadier of the reason for SL killing Indian Fishermen and he said SL is only chasing them. In other Breaking News. Amaraweera has said there was a plot to assasinate MS by UNP and JO. Yep. In late 2015 and early 2016 there was high speculation promoted by a paid astrologer that MS would die due to an “attack” by “Senasura” on January 26, 2016. Anyways, close to the date, the same astrologer said it would not happen as Senasura suddenly detoured, an eventuality which he never thought earlier. :D Anyways, this time it is humans. If true, the President should be careful. If it happened the power will go to Ranil’s blood stained hands as planned initially when using MS as the bait (sorry for being unkind, PM) but the outcome will destroy Sri Lanka completely. Therefore, may the President live a long life! Too many Sri Lankans are an uncompromising hate filled lot….the Western Europeans have evolved into a much more humane and civilised people, an example to the hateful people who comment on this forum. Are you trying to sell your pulp fiction to gullible readers in this forum? I believe you know there is no such thing as free lunch. Though gullible they are not that gullible to fall for your free publicity. The High Commission of Sri Lanka in London, not now even before, never had the backbone to raise the issue of promoting a banned terrorist outfit in the UK by Tamil diaspora and them using a banned terrorist flag in protests against a sovereign country. Those who find fault with the Brigadier also doesn’t talk about the most prominent issue here. Most of our politicos think that Tamilnadu politicians live on “fishing”. Their main income is illegal drug business. Many fishermen are drug traffickers. From wealthy elites to the poor, Indians are addicted to some kind of a drug. Cocaine is the most popular. Sri Lanka is their ever-easy transit hub. Our youth is getting addicted to drugs at an alarming rate. Sri Lanka hasn’t still realized the dire need to curb the drug trafficking via sea where ships, vessels and fishing boats play a major role. Tamilnadu fishermen issue will never be able to solve by apprehending fishermen. They should be chased away at our maritime border without letting them pass it. Why do you think the gesture caused a bad image to Sri Lanka? Our Brigadier replied to LTTE diaspora through a perfect gesture for their slogans of Prabhakaran as their leader and their separatist Tamil Eelam dream. This is the language LTTE terrorists understand. What other language they would understand? This has opened up a good opportunity for the SLHC to raise the issue of LTTE protesters using the flag of barbarian terrorist Prabhakaran’s terrorist outfit and promoting his separatist ideology against a sovereign country. Chathura, you are a good presenter but “don’t make fool of your self”. It is pretty clear that the two footages you show are 2 different events. It is bloody foolish of you to make stupid comments on them! The Authorities messing up the issue is a different issue altogether and the Prez taking political advantage of it is another matter! Chathura, you are a good presenter but “don’t make a fool of your self”. It is pretty clear that the two footages you show are 2 different events. It is bloody foolish of you to make stupid comments on them! The Authorities messing up the issue is a different matter altogether and the Prez taking political advantage of it is another matter! At last the viewers of TV Derana are opening their eyes. Derana has been running political debates in which their motive is only to attack UNP. They have forgotten how the ill gotten money contributed to their own creation. I find Chathura of all the to be fairer than Dilka Samanmali. But Sanka is the worst. Unfortunately these anchors push the participants of the political debates to attack UNP and worst of all they do not FACT CHECK the lies told by the participants. As an anchor its their duty to ensure that truth is said in their program. If not these anchors become a conduit of spreading false information and their credibility as an anchor is diminished. Since press freedom is new to Sri Lanka after Mahinda’s controled media era, the Yahapalana Government or any new Government that will be formed should make it compulsory for all political telecasts to have one or two Fact Checkers in addition to the anchor participating in the program. During the recent telecast of Mahinda Rajapakse, Dilka allowed Mahinda to tell various lies and she did not correct him or challenge him at all. This proved that the Mahinda telecast was a FIX set up by Mahinda and Derana and not a true 360 interview. It is also shocking to me why none of the characters attacked during these telecasts do not file legal action against the anchor for facilitating false derogatory information to the public. Its time SL media freedom should improve by self regulation and fact checking. Derana is not reporting any NEWS and it just joking with the people those who do not have much knowledge about the NEWS items. This will be ended very soon since people got to know about them as they did for the SIRASA TV. Mr James Panda, Are you so sure that Senanayaka, Jayawardene, Wijewardana and Kothalawala changed their religion to do pakkali service to suddhas? Why not come out with facts to prove that, Mr Bloody Punda? British gave whole of Sri Lanka because the whole country which was named as Sinhale before colonial parasites came belonged to Sinhalayo and Veddas. The word ‘Demala’ is the term coined by Sinhalayo to refer to South Indian invaders. There are no Tamils in Sri Lanka; only ‘Demalu’ who are the descendants of invaders and slaves brought by colonial parasites. Please do not display your ignorance of the history in public. The news presenter must not be blamed. The news editor felt that he/she could get away with it. This is as clumsy as the explanation that Brigadier Priyankara Fernando was just scratching his neck. Often the defenders make things worse for themselves. You reminds me of “More catholic than the Pope” quote. Big deal every media outlet spin the story. AD and all others reporting about Sri Lankan affairs are the same not a single exception. It is said Mahesh Senanayake’s position is that “No Leader, No Commander, No Soldier can be investigated”. He has said there is no investigation on this goon. Aappa Diplomacy Foreign Affairs Ministry is somersaulting as per the White Flag needs for LG election, where White Flag team is predicted to lose. These actions confirms that this July 4th Drama was rehearsed in Colombo and acted in London to propup White Flag’s election votes. Unless London police get into this, the Colombo White Flag administration’s the election stunt of this not going to come out. There is a News Piece that BD opposition leader Khaleda Zia is punished with five years for corruption. India let Sonia and Karunanidhi on 2G. But punished central ministers on other cases. Famous one is Jayalalitha’s punishment. Nothing like happened in Lanakwe. Seriously it seems people make comments according to the headline….!!!! Agree. But Derana’s deliberate “good” intention backfired as sound moves slower than light. 99% people who watched the video have thought Brigadier talked to the protesters after pointing at the Lion symbol on his sleeve and the gesture, on the same day. The words “in an earlier occasion” should have been used with clear description of the occasion in the title, instead of Chatura’s speech. Disregarding all the other considerations, in this instance, the guy needs to be sacked for his stupidity.